The DIY Dabbler | Starting with the basics and building a home. Starting with the basics and building a home. Time to Shed Some Pounds Ladies! Ok, so one of the projects I like to dabble in is weight loss. Yes, I know you’re not supposed to dabble in losing weight, but actually commit to it. So, I’m going to dabble in committing to losing weight. One of the perks of being in a relationship is that the signifiacnt other will love you no matter what size you are. At least, that was the case for me. He Who Shall Not Be Named (I love Harry Potter!) was one of those significant others. At 6’4″ and roughly 250 lbs, he ate whatever he liked. That usually consisted of every fast food restaurant on the face of the planet. And he encouraged me to join in the fun, liking that I had more “curves” than the average woman. Looking now on the rubble that was my last relationship, I notice I am left with some extra men’s T-shirts and about 30 extra pounds. I’ve tried Weight Watchers in the past and loved the ease and flexibilty it offered. I restarted my membership not long ago and found that the love is still strong. Only now I notice that I can no longer lose weight just by eating better. I HAVE to work out. But I HAAAATTTEE going to the gym. HATE IT. A friend suggested the Body By Bethenny dvd. So I stuck it on my Christmas List and hoped for the best. Thanks Mommy and Daddy!!!! I’ve loved Bethenny from the first moment I saw her on The Real Housewives of New York.She’s funny, energetic and totally bonkers. That’s my kind of girl. That same attitude is present in her workout dvd. Program 1: A 40 minute yoga workout, and let me tell you folks, it is tough. My arms were on fire after only a few poses and I’ve done my fair share of yoga classes. If you haven’t done yoga before, I would recommend watching the program first to learn the poses. You don’t want to have to constantly look up to see what they’re doing. It kinda throws off your inner chi or whatever. Program 2: A 10 minute strength workout that requires small hand weights. I started with 2 lb weights. At first I didn’t feel like I was even working, but after a few more reps, I was burnin. There’s also a bonus booty workout that I haven’t tried yet. I’ll keep you posted on that! You can purchase Body By Bethenny through Walmart for $10.46 and I think Amazon has it for around $7 or $8. Try it out and tell me what you think! Ok, so I started this blog for a college class and then quickly dropped it at the end of the semester. I just couldn’t get into blogging and couldn’t tell my professor why. But I think I’ve figured it out. This class came with RULES! I’m pretty sure the point and allure of blogging is that it doesn’t really have any rules. Sure, there are some guidelines and proper etiquette good bloggers should follow, but there shouldn’t be rules on what you can post. As much as I liked posting about DIY ideas for poor young adults like myself, it was limiting and I got bored quickly. So I’m changing it up! I’m at a point in my life where I need something to change. My job isn’t the bustling career I’d hoped it would be, my friends have all moved away and I recently got dumped. Now while this sounds like tragically good country music song, it’s getting a little old. So is living with my parents. I love them dearly and they are easy to live with, but I need some independence…and fast. Since I currently can’t afford to live on my own and the roommate possibilities are bleak at best, I’ve decided to start with smaller changes. Like my blog! This is no longer just about DIY ideas. I want to blog about everything I love and how I’m working on getting a life back. Hope you enjoy the journey with me!!! Let’s start with a picture from my FAVORITE magazine. Country Living!! Country Living Living Room - I die!! Does anyone else have a problem with “out of sight, out of mind?” I sure do, especially when it comes to my jewelry. I’ve never worn a lot of it to begin with, but if it’s tucked away in a jewelry box, there’s no way I’ll put anything on. So I have to have my jewelry out for display, preferably at eye level, so I don’t miss it every morning. 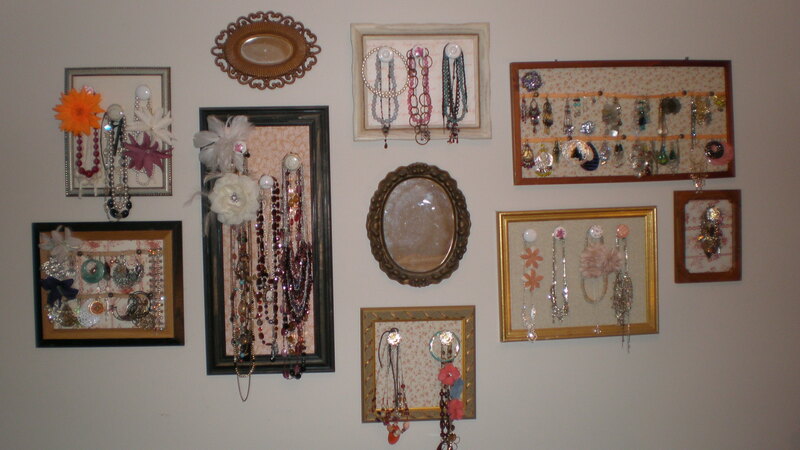 There are a couple of different ways you can display your jewelry to match your style. 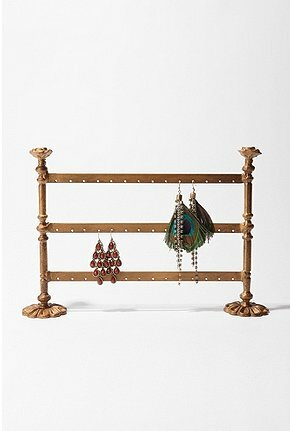 This is a pretty simple earring stand that would match a lot of different styles. Some places also sell the hand stands that are great for holding rings. Personally, I find them a bit creepy and would be terrified to wake up in the middle of the night and catch that out of the corner of my eye. Yikes! 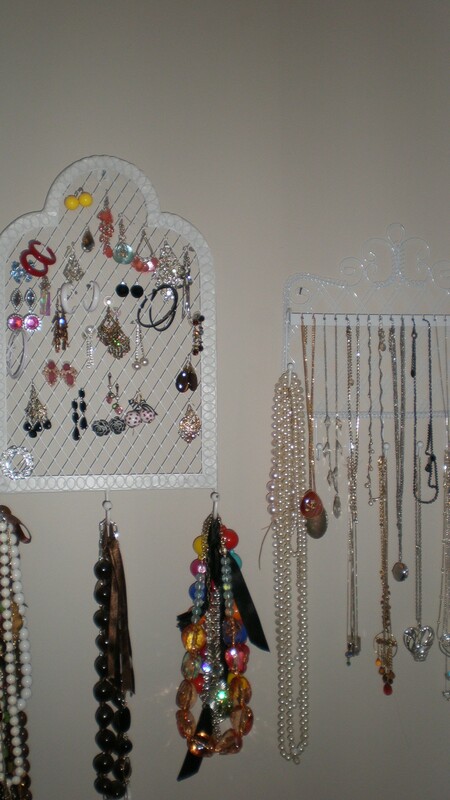 Here is an example of a jewelry stand with some flair. It’s the Eiffel Tower! How cute is that. I bought this at Hobby Lobby for only a few dollars. I chose to repurpose it as some wall art. If I ever get any dresser top space again (not likely) I may use it to hold some necklaces and earrings. The easiest way for me to see my jewelry every morning is to put it at eye level, which for most people is shoulder level as I am only 5′ 1″. I found these totally awesome jewelry wall hangers at Urban Outfitters. They fit all of my big necklaces, especially the heavy ones, and all of my earrings that aren’t small studs. I believe these were around $20 each and I used the monkey hooks from an earlier post to hang them up! Step One: She shopped for weeks for cheap frames and fabric scraps. I would look at stores like GoodWill, Hobby Lobby or any local thrift store. Step Two: She covered the backs of the frames with soft filler and the fabric swatches. 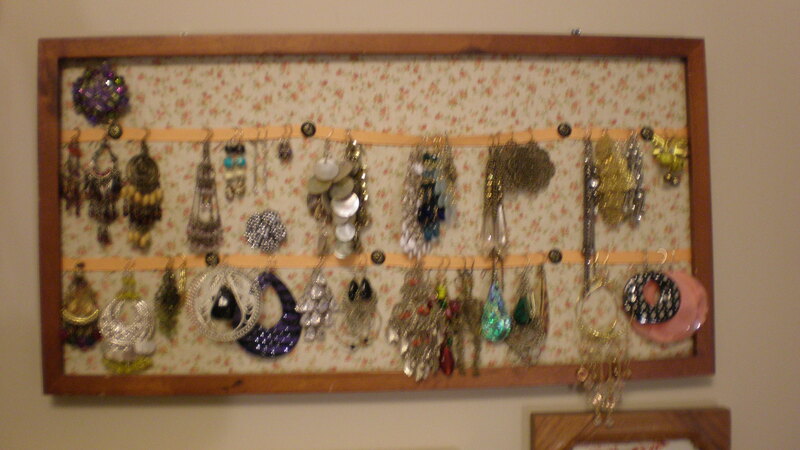 Step Three: She laid out thin ribbon pieces as jewelry holders and used tacks to hold them in place. 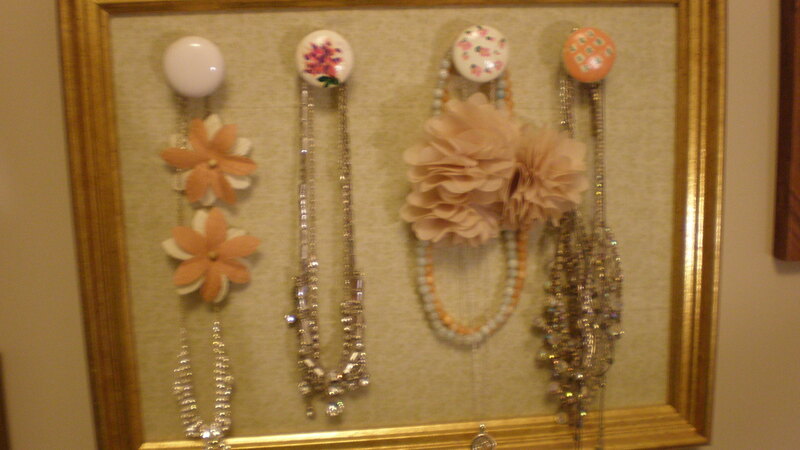 She also found and painted dresser knobs (Hobby Lobby as tons), then screwed them into the back of the frame board. And voila! She has a beautiful display for all of her jewelry! Recycle, Reuse, Reduce…your craft budget! I mentioned earlier that I come from a family of crafters. My mom and grandma had a crafting business for many years. Nothing full-time, but they worked hard and did a couple of local craft shows a year. The two of them made a good pair because they recognized each others strengths. My grandma is the creative one. She is the artist who is always coming up with new ideas, for example, she recently has been in gourd painting since she moved to Arizona. My mom is a production kinda girl. Whatever grandma comes up with, my mom mass-produces it. I often wonder which one I take after more. I would say I’m pretty creative, but I’m also fond of borrowing ideas. Rarely do I come up with a great craft idea on my own. Especially re-purposing. I just can’t see how people can look at one item and imagine how to turn it into something else entirely. To me, that is more of an art than the actual execution. I guess my brain just doesn’t work that way. 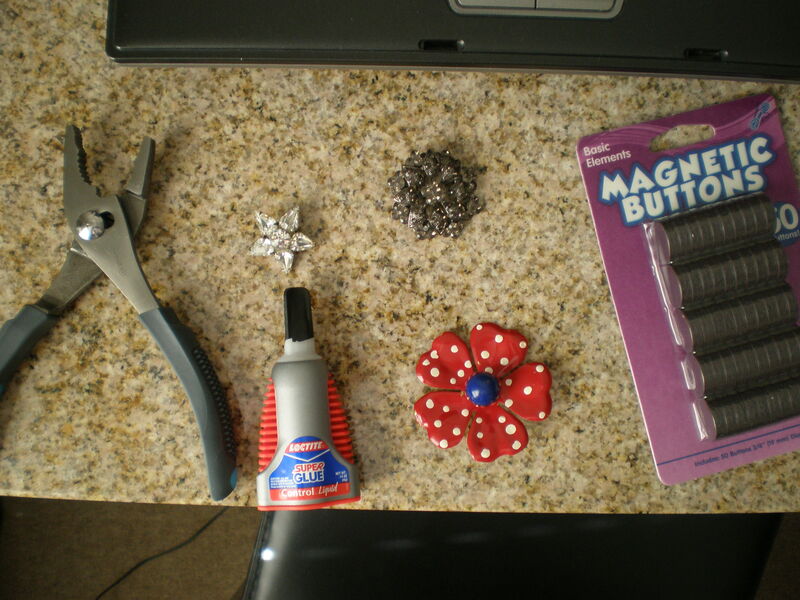 Which brings me to today’s do-it-yourself: Remaking vintage pins into magnets. I’m borrowing this idea from Country Living. I’m obsessed with all things vintage and especially the clothes! A while back my grandma let me raid her jewelry box and I took home some lovely vintage pins. Unfortunately, I am terrible at remembering to put jewelry on in the morning and have never worn them. So why not re-purpose them?? 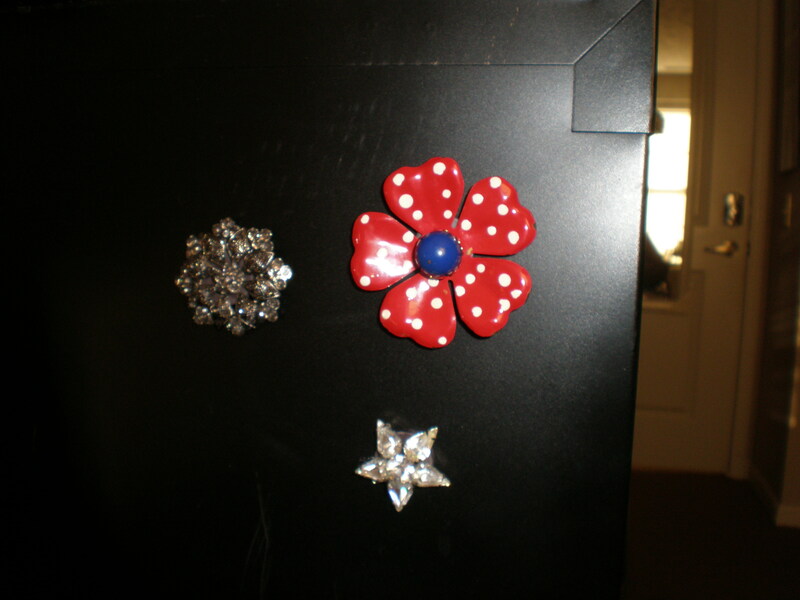 I have three pins (okay one is from a blouse from Forever21), pliers, super glue and magnetic buttons. Step One: You have to remove the backs from the pins. 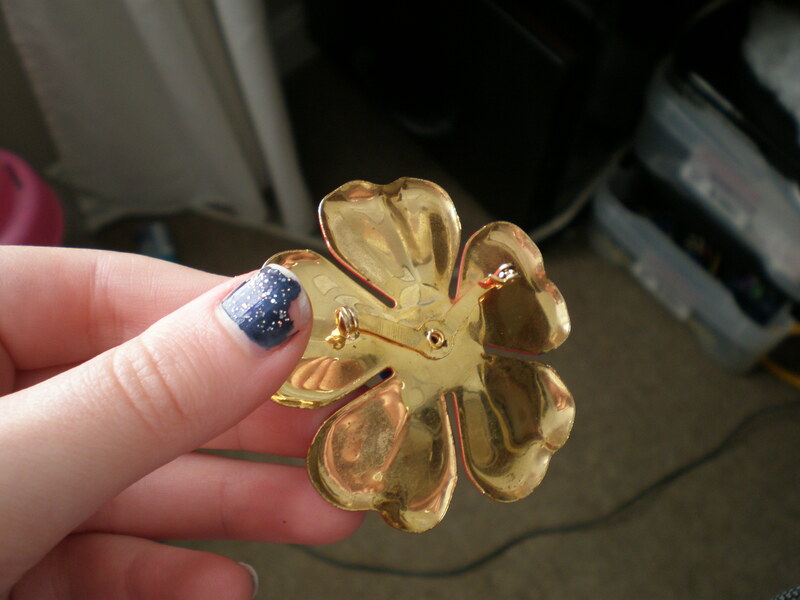 For the flower pin and the star I only needed to remove the actual pin. The black pin needed everything on the back taken off or else the magnet wouldn’t stick out enough to stay on the fridge. 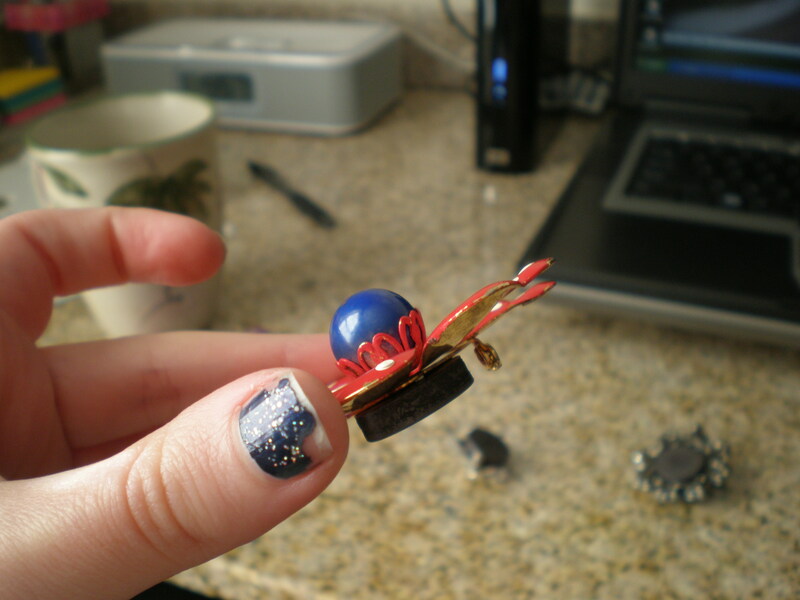 Step Three: Hold the magnet to the pin for a bit until it dries. You can also just lay it flat for a few minutes. And that’s it! It’s so incredibly simple!!! I actually don’t hang things on my refrigerator typically and many fridges today are stainless steel and are not magnetic. I think I’m going to take mine to work and liven up my overhead metal cabinets in my little cubicle. 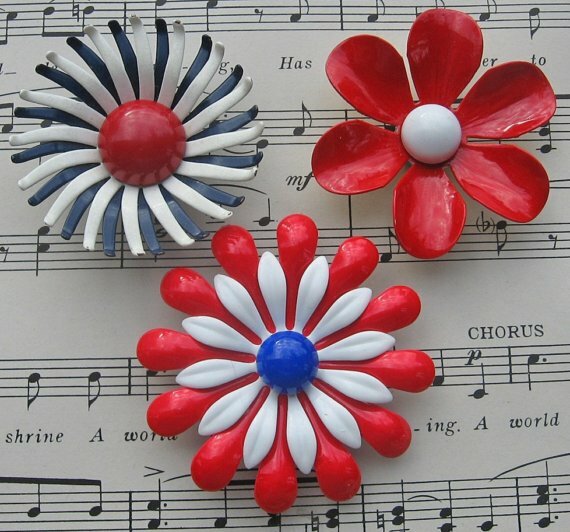 Now for those of you who absolutely CAN’T find any cool pins you can also buy these from fun crafters like this one at etsy.com. This magnet trio retails for $18. Is this the answer to my dabbling spirit’s prayers? Finally, there appears to be a magazine out there for people just like me. People who like to dabble in everything…or close to everything (nothing illegal of course). I perused the entire first issue online and I started bouncing in my seat with excitement. 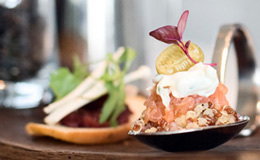 While the magazine doesn’t cover everything you can dabble in, let’s say fishing for example, it does cover three of my favorite topics: design, travel and food. The design section features DIY tips, home tours and other creative tips. This section is the most poignant for my blog’s current theme. I plan to branch out to other dabbling areas eventually. Like, when this semester ends. There were some fun articles on re-doing your hallway and spicing it up and some home tours of GORGEOUS houses. But the winner for me was the interview with Diane Von Furstenberg. The DVF diva herself. I think I drooled a bit on the keyboard. She mostly talked about her new home collection, which is as stunning as her iconic wrap dress. This travel issue takes us to Prague and all of its wonder. The pictures were spectacular and brought back fond memories for me. I was an exchange student to Germany and we took a EuroTour that included Prague. That was definitely one of my favorite cities. Another great stop was Nashville, Tennessee, a city not too far from me, and sadly I’ve never been there. Funny how that happens isn’t it? Sometimes, there are great places out your backdoor and yet, you only dream of going far away. Mmmm food.And they started off with the most important food group…coffee. I’m in heaven. There were some delicious looking recipes in the issue, but they looked pretty advanced. I’m definitely in the beginner’s class when it comes to cooking. My diet consists mostly of coffee, Ramon noodles and whatever I can steal from my mom’s fridge. This brings me to the PR question of the day. Is it a good idea to post the entire issue online? Personally, I loved that I flip through the entire issue online. It got me really excited about the release and future issues. If they plan to release every issue, where’s the incentive to subscribe? The last page lists the different social media the magazines follows, such as its favorite blogs, Facebook fans and Tweeters. I can’t decide if I like this idea or not. The PR person in me says, yes! You’re on social media and clearly involved. That’s great! On the other hand, if a magazine was mentioning me in its pages, I would have a hard time not writing glowing reviews of every issue. What can I say? I can be bought. This asks an ethical question. I can’t wait to see the magazine and how the social media part plays out. Today’s lesson is all about being creative and cheap. A great way to spruce up a room and not spend a lot of money is to put down a rug. They can really add a lot to a room. Now, I get tired of seeing the same designs on rugs sold at my local Target, Wal-Mart, and Bed, Bath & Beyond. They all just look the same to me. Everything is either stripes or circles in various brown and beige or huge designs in neon pink and green. None of that screams me. So why not make my own? I can choose the type of rug, colors and designs I want to have. It makes searching a whole lot easier and the price is just right. Since it’s my first time, I wanted to start with an easy rug to paint. 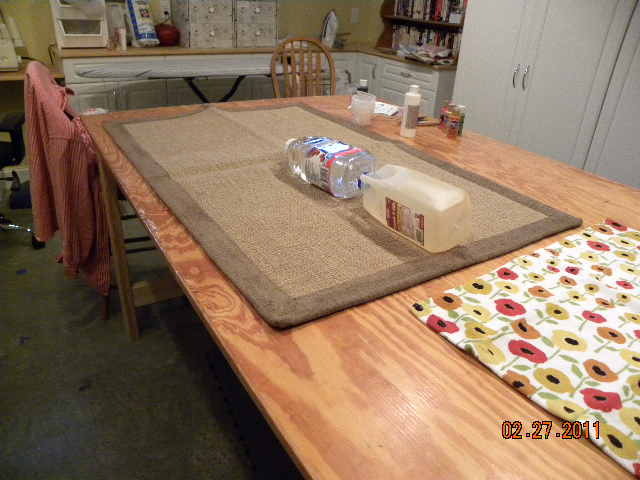 I perused my local stores and found a small sisal rug that would work perfectly. It’s a good starting point rug. It’s nice and flat, so learning how to put paint on it shouldn’t be too difficult. I’ve learned fabric paint is the best way to go with rugs, because it won’t wash off and it shouldn’t crack after drying. 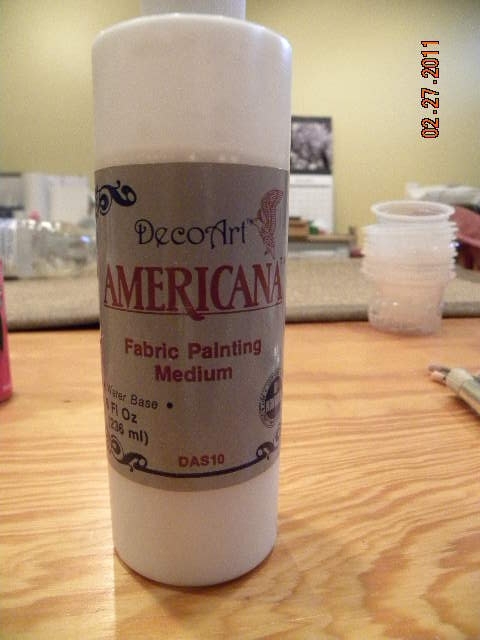 I decided to use craft paint and add a fabric medium found at my handy dandy Mom’s house. Thanks Mommy! It’s fine to use different brands. It’s more important to get the colors you like! The directions on the back say to use a 2:1 ration. Two parts paint to one part medium. I basically just started pouring and made sure I used more paint than medium. It seemed to work well. I’ve seen some wonderful designs that used painter’s tape to map it out. It’s an easy way to create a fun striped pattern and not mess it up. But I’ve always been more of a free-hand kinda girl. I did find a design to use as an inspiration. I don’t like to exactly copy designs, because I feel like I’m cheating. 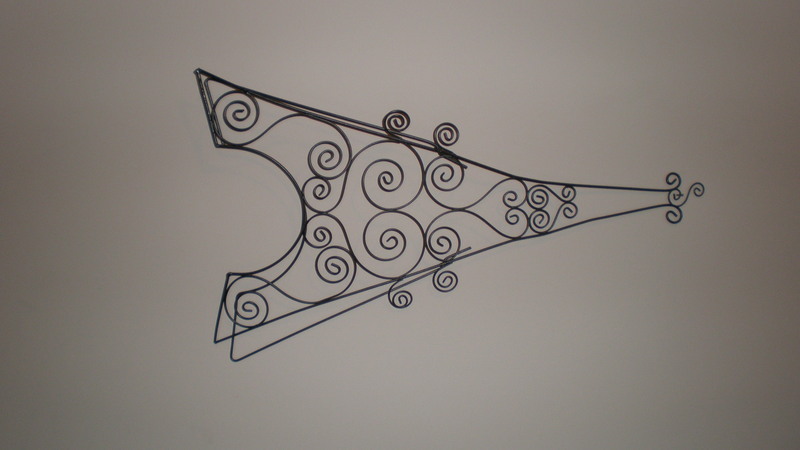 Sometimes the only way to find your creative bone is just to try to make a design your own, with small changes. For Christmas I got these adorable hand towels for my kitchen. I wish I knew where they came from, but Grandma forgot. 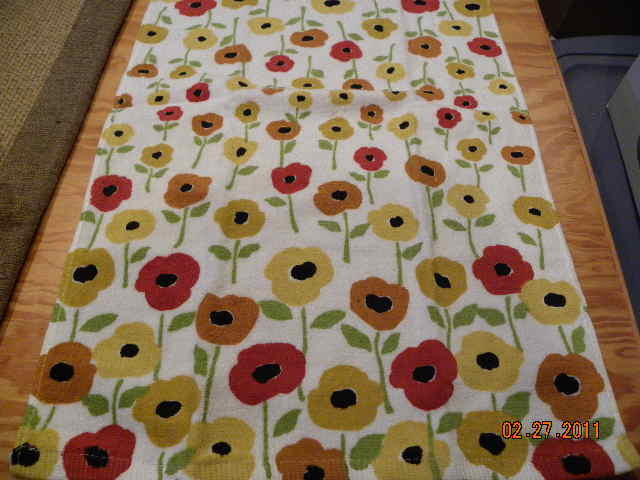 I love this flower towel and figured that would be an easy pattern to start with. I used brushes with stiff bristles so I could dab the paint into the rug fabric. 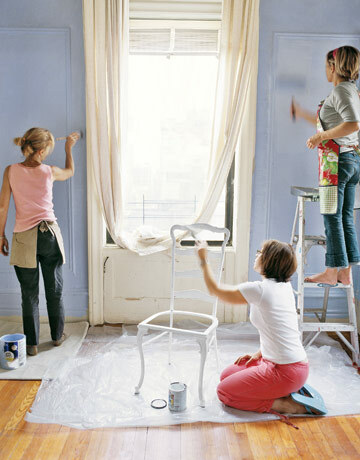 Brush strokes don’t really work, because it will take you six years to get enough paint down. 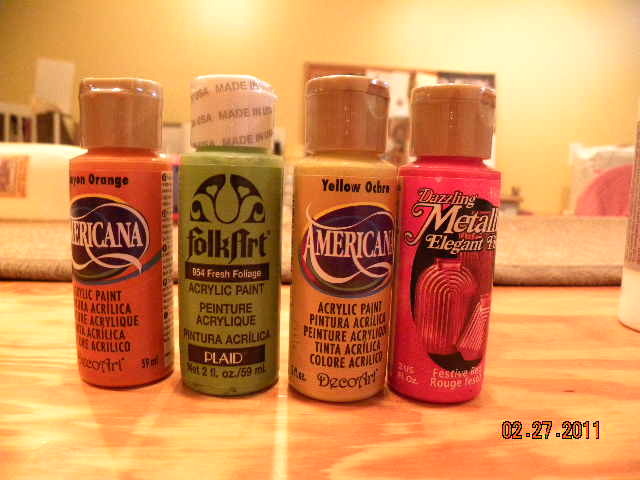 You have to use quite a bit of paint but I ended up with leftover in the mini bottles. I tried to free-hand but the design was getting pretty off-centered. So I painted small circles the rest of the way down the rug to map out my flowers. All in all, it was a simple project that only took about two hours to complete (not counting shopping time) and the cost was under $25. It probably would’ve gone over, but I was able to borrow the brushes and medium from my Mom. I wasn’t thrilled with the final rug, but I was happy with my first try. I wish I could’ve found a lighter rug to start with. 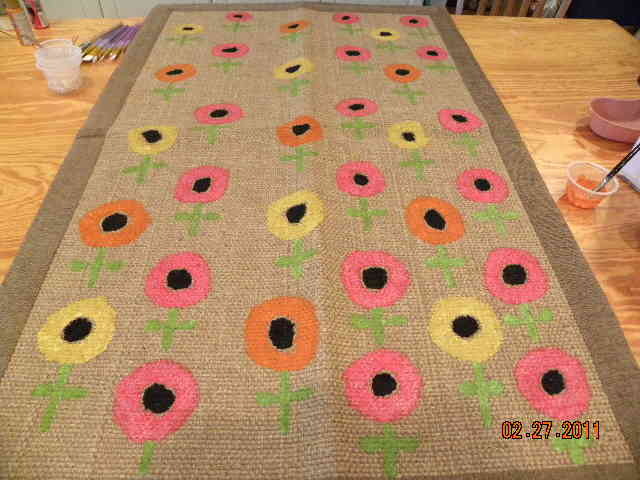 I think for the next one, I’ll use the same rug but do larger flowers (maybe peonies) in white. Stay tuned! P.S. Here are some bloggers who inspired me and did it better! Members treat Curbly as their own blog and post anything and everything that has to do with interior design. Some just post pictures of things they like. The pictures could be from their own homes or other designs. Also, members can post links back to their own personal blogs. Many members who are professionals, use Curbly as an additional channel for their blogs. 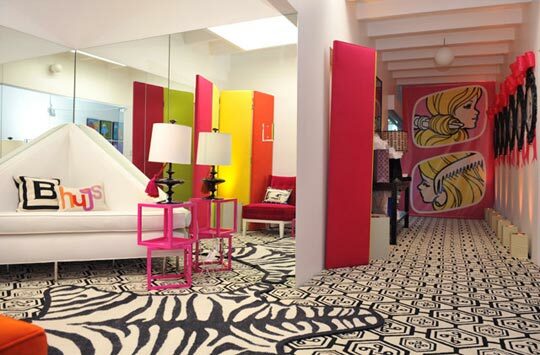 This member posted pictures of a Malibu Barbie Dream House designed by acclaimed designer Jonathan Adler. Her post doesn’t cite Mr. Adler as the creator, but it does reference the site where she found it. Not sure that was a great move, because at first, I thought it was her design. Others post articles they’ve found interesting and want to share. This member posted about the house where serial killer Lizzie Borden lived and how it is now a bed and breakfast…creepy. His perspective was on whether or not the owner should have to disclose the histories of the house. He made some great points. I know I’d want to know if I was staying in a house where a serial killer lived and committed her crimes. YIKES! Many members post their own do-it-yourself pages. This one is about painting floor mats. Since my blog is all about easy do-it-yourself, this post was right up my alley. 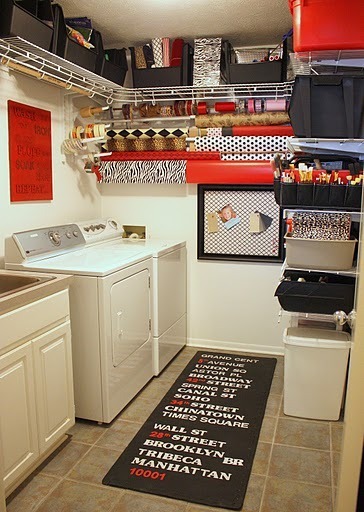 This laundry room looks so cool! I probably wouldn’t go that far with designing a laundry room, although that’s hard to say seeing as how I don’t actually have one yet. Nonetheless, it looks awesome. I wonder how functional it is. Now this member also has her own blog called The Exchange. Her blog has over 300 followers and her recent post on Curbly already has over 65 views. Not too shabby. The “clippings” page my just be the coolest thing yet. I have all of these new projects I want to try and they all started with a picture. I have books and files everywhere of pictures I love. I mentioned in my first post about finding your style by collecting images of things you loved. I like to do it in a three-ring binder, but I also said the internet was a fabulous place to find pictures and Curbly is a great place to keep them organized. to collect the images you simply add the “Curbly It” tab to your Bookmarks and whenever you come across an image you like, you can Bookmark it with the “Curbly It” and it adds it to your clippings. It also adds the website where you found it. I like this because I don’t feel like I’m stealing it. Check out my beginning clippings collection here. These were just two of my favorite highlights of the website. There’s so much more to check out and do. What was your favorite section? As much as I want to learn to do everything and make everything by hand, I have to admit that I can’t do it all in the next six months. So, some of my decorations will have to be bought. While I love nearby stores like Target and Bed Bath & Beyond, sometimes their selections can be a bit limiting and well, manufactured looking. I come from a family of crafters, who’ve created handmade Christmas items for as long as I’ve been alive. They used to do half a dozen craft shows a year, mostly at local schools, churches and convention centers. Not exactly a broad audience. But now, crafters can sell to all over the world on a site designed specifically for them. It’s called etsy.com. According to the website, etsy’s mission is to create a world where people live handmade. It hopes to accomplish this by reconnecting makers with buyers. It’s reach spreads to over 150 countries and a team of bloggers help keep viewers and handmade enthusiasts engaged. The site sells everything from clothes and accessories to furniture and art work. The awesome part is that EVERYTHING is made by hand. The price range is enormous and will run anywhere from $6 for a vase to thousands of dollars for art and furniture. Each seller receives comments and ratings about their products and services. This is helpful so you don’t get scammed with crap items. Also, many designers will do custom work, often for free or a few extra dollars. So no more owning the same rugs and pillows as your neighbor. The blog is separated into different sections, such as how-to, a section specifically for sellers and “This Handmade Life.” This section spotlights different handmade items it thinks the readers would enjoy.With comments numbering in the hundreds per post, clearly they’ve found an active and interested audience. The coolest part: Crafters now have a new outlet to sell besides locally or their own websites. A quick scan of the pottery section revealed to me that beauty is still in the eye of the beholder with some of the wares, but I did find some beautiful pieces. I’ve become obsessed with the pottery, ceramics and the furniture section. This shelf is so adorable and not badly priced. That would go great in an entryway. This is something I could probably learn to make myself, but it would require knowing how to use a saw for the mason jar hole. While I have mastered the power drill, I don’t think I’m quite ready for saws. Buy in this color or others for $40. 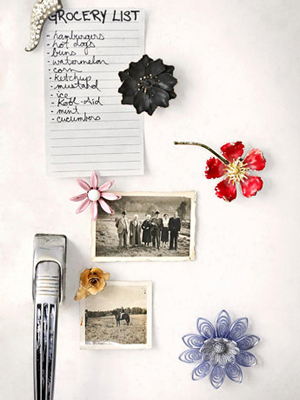 The designer, who goes by autumnrollick, has many similar pieces to fill an entire shabby chic household. And the prices aren’t bad either. Pieces from Shabby Chic pioneer Rachel Ashwell can run into the thousands of dollars, making $245 a pretty sweet deal. Buy this piece or view autumnrollick’s other peices here. Three women joined forces and creative talents to re-do a small city apartment. The photos are truly inspirational and the designs are beautiful. I was slightly disappointed when they didn’t go into deeper detail about how they accomplished some of the design jobs. For instance, they did a wonderful job with the wall stencils, but I have no idea how to stencil a wall. Maybe I’ll have to do some digging for a stenciling how-to of my own. Also, many of the other stories on the website tell you how much any new additions cost. Normally, all items are listed with prices and links to the stores. 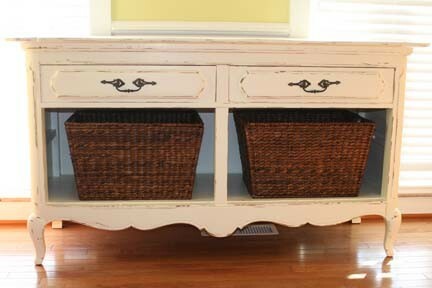 I was sad this post didn’t include those because I LOVED the dresser knobs. Even though it says they were purchased at Restoration Hardware, most people (including yours truly) don’t feel like digging for it. Nonetheless, the post was inspirational in all of the projects you can accomplish quickly. Also, I adored how they re-purposed vintage accessories. Hooks, Hammers and Power Drills, Oh Yeah! 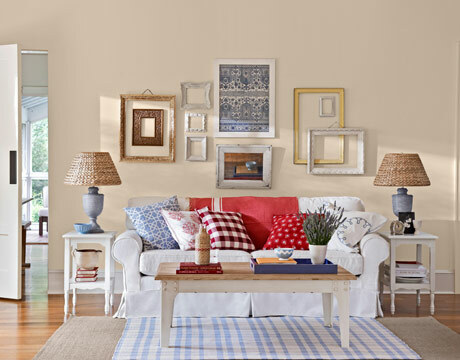 Sometimes the easiest way to update a room is to hang pictures, artwork or even some cool shelving units on the walls. They instantly add more visual appeal and/or handy storage. 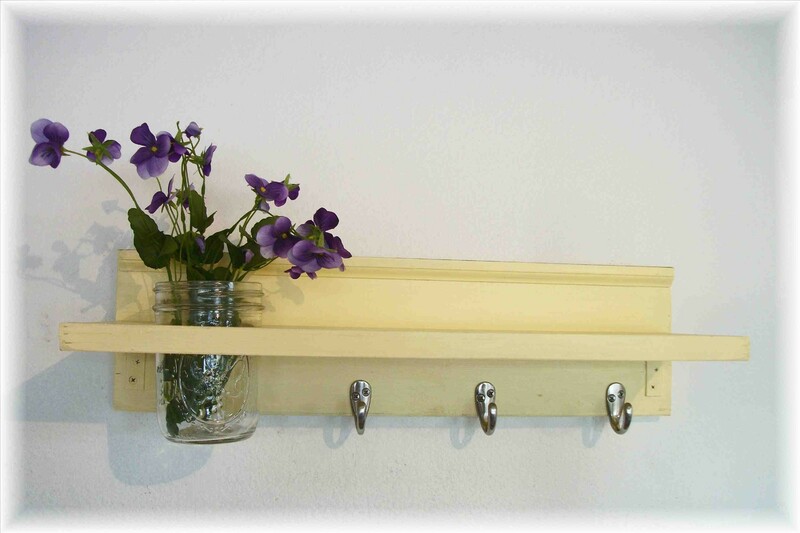 There are quick, easy ways to hang items on walls and there are a few slightly trickier ways. We’ll start with the easiest and work our way to the hardest. 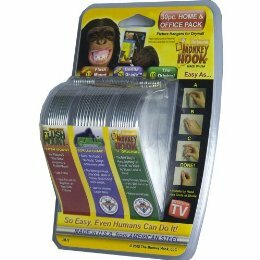 These handy hooks are inexpensive (about $10 for 30 hooks) and they are super easy to use on drywall. All you have to do is push the hook into the wall where you want it, twisting back and forth while you do, until the hook looks into place, securing it to the wall. One of the benefits is that you don’t need to mess around with hammers and nails or power drills. The rounded design allows the hook to lock into the drywall. By doing this, the hook can hold more weight than a hammer and nail, because it’s more evenly distributed. Pretty simple, right? They’re designed to hang items on drywall, but eventually you’re going to hit a wall stud somewhere. You’ll have to avoid these by using a stud finder or choose option two. This option requires more tools and more care with your thumbs. A tip is to tilt the nail upwards so it’s easier to hang items. Directions are pretty self-explanatory. You place the tip of the nail to the wall and tap it with the hammer until it’s in place. The trouble comes when you smack a thumb (been there done that) or have to remove the nail. This is when walls get torn apart and the MonkeyHooks are a bit better. Now comes the fun part! I’ve watched do-it-yourself shows for years and always wanted to learn how to use the power tools. Well, finally I got my chance. I got a coat/scarf/hat rack that could hang and the safest way to keep it secure was to screw it into the wall. Normally, this is a task I call on my dad for, but for once I’m going to learn to do this myself. I was pretty nervous, because my dad and the people on the designer shows always make it look so easy. You see the drill flying in and out of the wall like nothing happened. But hey folks, that’s a pretty powerful tool. Here’s another good video to watch. He’s not exactly entertaining, but he has some good, extra tips on using an electric drill. I stumbled a bit when using the drill to put the screw in the wall. Professionals can do that in one fluid motion. But I’m not a professional and that wasn’t too bad for a first time. Using the drill was actually easier than I thought and a whole lot of fun! Now I’m ready for the big guys. Bring on the table saws and rotary sanders! Okay, maybe not quite yet.